Peopled by figures both uncanny and tragic--lionesses who dance and cry, surgeons who carry with them the trauma of past lives, an opera singer whose notes go awry--Not on the Last Day, but on the Very Last uses the language of dreams and of fairy tales to deliver a keenly felt exploration of family, grief, regret, and belonging. Here everything stands for something else. But though the Freudian mother and father lurk behind every sequined costume, continue to strip away the masks, Boening suggests, and you'll find an even more primal absence at the center--Nobody, No One, mortality, death. Beyond that, we find, lies only the truth of our relationships with each other. Shot through with mournfulness, gorgeously spangled in its language--"a squall of chrysanthemums / and the weird"--Not on the Last Day, but on the Very Last is an unforgettable collection about our human failings and the grace we each seek. 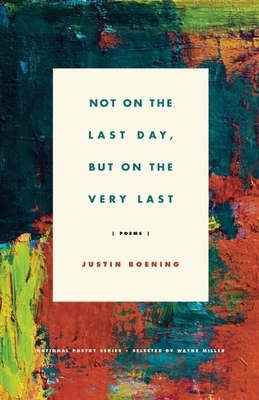 Born in the Adirondacks, Justin Boening is the author of chapbook, "Self-Portrait as Missing Person," selected by Dara Wier for a Poetry Society of America National Chapbook Fellowship. His poetry has received a Discovery /"Boston Review" Poetry Prize, and other awards and fellowships from the Bread Loaf Writers Conference, Bucknell University, Vermont Studio Center, Summer Literary Seminars, and the St. Petersburg Review. A graduate of Columbia University s School of the Arts, Boening is currently a senior associate editor at "Poetry Northwest" and an instructor at the Columbia University Summer High School Program. He lives in Iowa City, IA.